Hello hello hello! And welcome to my blog! If you are here for the hop, perfect, you are on the right track! Especially if you came from Melissa Bickford (link)! Please scroll all the way down as there's a giveaway in this hop! Because welcome to a very special Blog Hop collaboration with the WOW! Embossing Powder (link) and Honeybee Stamps (link). As you know, the most fun part of having a blog hop is meeting, sharing and inspiring one another in this beautiful crafting community. We feel so blessed to have our paths cross with each other and we all hope this collaboration inspires you all. If you get lost along the way, heed back over to the WOW! Embossing Powder (link) to check the bearings or see the hop list below. I made a sweet mermaid card for this hop. The stamps used in the card are from Honey Bee. To make the oceanic background I used several Wow powders and made thick layers with them. The see through powders mixed and created a wavy blue background for the mermaid to swim. I also added some sequins from Honey Bee to make the shaker part to the card. No blog hop is complete without some prize, so are you ready for some awesome giveaways? Both of the companies are giving away prize. WOW! Embossing Powder has a set of 6 powders of your own choosing along with a WOW carry case to store your new goodies. you powders safely in. And from Honeybee Stamps you have a possibility to win a $50 gift card. So what I need to do, you ask? The only think you need to do for a chance to win is leave a comment on each of the design team members blog hop! So hop along and remember to comment! The winners for the giveaways will be chosen at random from the comments left on ALL THE POSTS of this blog hop by EST on 14th June 2018 and will be announced on the Wow! blog on 15th June 2018. So thank you once again for stopping by and an oceanic hello from Finland! Please browse a bit more if you like the card! When you want to head forward, your next step is Rosali Bartz! Adorable card! Love that mermaid!! Thanks for sharing! Darling mermaid card. 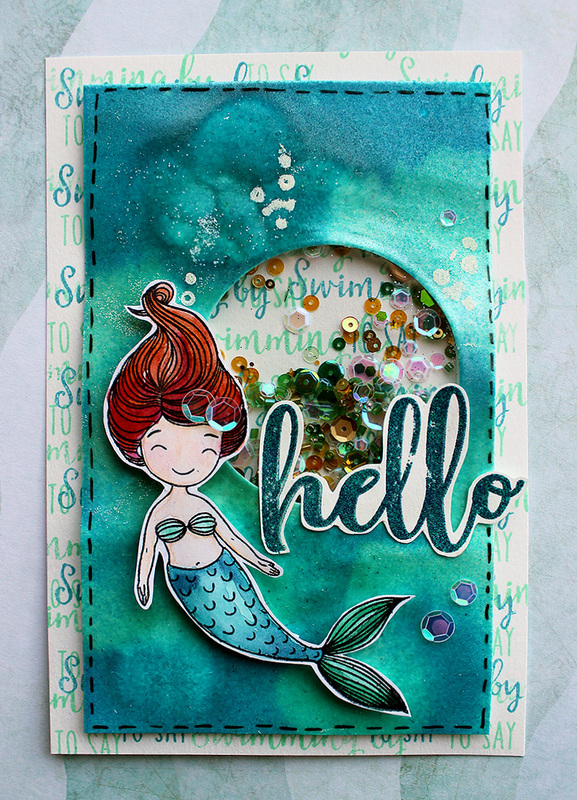 I love the background... very watery... and I really like all the time you put into the details... with the bubbles, the word background and shaker... Really great card. This is just a stunning work of art! And pretty, too. And awesome because it's also a shaker - my fave! How sweet is that Mermaid!! I love her! Your card is stunning, the water colors are just perfect! Love the colours! Perfect for the theme - fabulous card. Im loving all this inspiration. I knew you would create something beautiful Riikka. Your card IS that and adorable, ethereal, fabulously rich in colour and the shaker adds the perfect mermaid fantasy otherworldly! I love the pretty sequins, the sweet image and the simmer, such a great card! Love the detail the background gives to the card. Ocean colours get me every time! Such a great card! Mermaids and shaker cards--perfect combination! Great shaker. Love the Lagoon powder. Love this ocean beauty with shaker cuteness! Perfect combo! Such an amazing background you created with the mix of embossing powders. The mermaid is adorable! I love that you added the shaker component where you can see through to the stamped background. Wow Riikka stunning as usual. My favourite colours and the fact that you made a shaker too is genious. Love that mermaid stamp and the EP's are just gorgeous! What a pretty card. I love the ocean background! This is an awesome shaker, your mermaid and background is coloured beautifully and I absolutely LOVE the Blue Glitz EP on the sentiment. So perfect! Who doesn't love a mermaid. Great card! Beautiful card! :) Love the background you made. Rikka, if I didn't subscribe to you I never would have found this blog hop!!!! Thank you for you inspiration you give me year round. Oh my goodness!! This card is just awesome! LOVE all of the colors you used, and you nailed that background! BEAUTIFUL JOB! of colors! Such a fun card! One of the cutest mermaids around. Fun card! What a great card. I would never have thought to use the embossing as a background. I found your blog thanks to this hop and I will be coming back. Wow, gorgeous card! Amazing embossing powder background. I love this mermaid...You have done complete justice to its beauty!! How pretty! Love the background and the bubbles! What a fun card!! Love the shaker and the background colors. Just Fab!! Awesome! Great colour and card!!! Thanks for sharing. Such a sweet card. And the background is gorgeous. 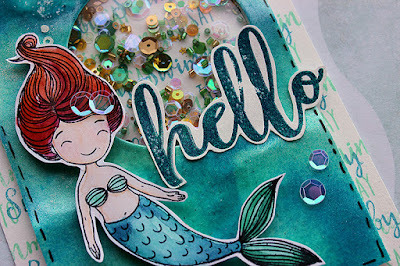 Sweet mermaid shaker card. I like the background. What a pretty, magical card! I especially love shaker cards. Adorable shaker card! 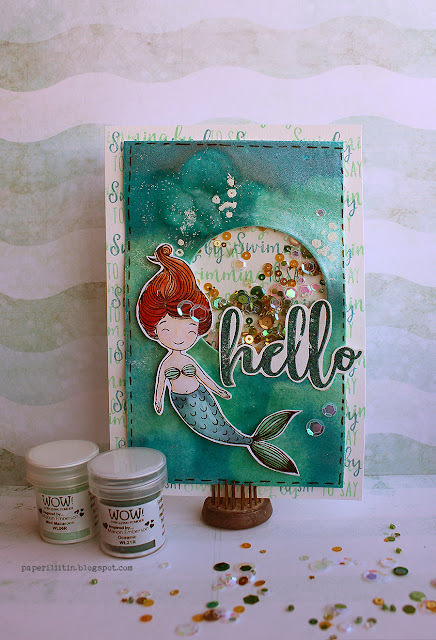 Love this sweet mermaid and the colors you used to make this pretty scene! You really captured the underwater look with your color choices. Super cute shaker card. Beautiful shaker card. Love the gorgeous background you created for this beautiful mermaid. 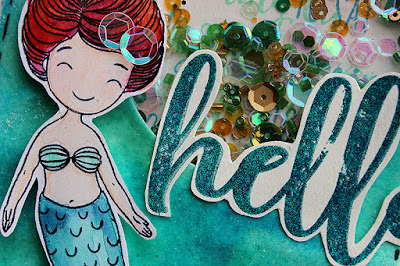 What a gorgeous background you created for your mermaid with the EPs!!! I love all the variation in color you got from the 2 colors. Great technique!!! This is gorgeous Riikka! I just love shaker cards. Oh my!!! Your shaker card is simply stunning!!! Love the colors!!! Of Rikka! Your imagination is just out of this world. I am big fan of your creativity. Just stunning ! Embossing powder for the ocean so clever! Beautiful! Thank you for sharing this sweet ocean themed card. What a perfect shaker and great use of the WOW products! This turned out fantastic! So pretty! Love all the sparkle, and that sweet mermaid. What a super cute shaker mermaid !